With the impending foie gras ban looming upon us, dinners featuring the luxurious but controversial ingredient have begun popping up left and right. Hell, I'd even gone to a couple myself at The Royce and Melisse. However, as far as I know, n/naka is the first Japanese eatery to attempt such a feat, which isn't too surprising given that foie doesn't play a huge part in Asian culinary tradition. I was quite smitten by Chef Niki Nakayama's precise, nuanced cooking during my last visit to her Culver City-adjacent restaurant, so I was eager to see how she would fold the liver into her eminently seasonal, kaiseki-inspired aesthetic. Inside, things haven't changed much at all since last time (though the wine cellar is now brimming); the space is still subdued, tranquil, just about the perfect environment to enjoy the subtleties of Nakayama's cooking. As for the menu, n/naka usually presents a nine-course Chef's Tasting at $110 plus $55 for wine, as well as a Vegetarian Tasting for the same cost. Diners may also step up to the Modern Kaiseki at $165 plus $85, and our special foie gras menu was basically a variation of that menu: a 12-courser ringing in at $180, with an additional $85 for some superb beverage pairings by new Sommelier Jeffery Stivers (Saddle Peak Lodge, Crustacean, Melisse, Patina). 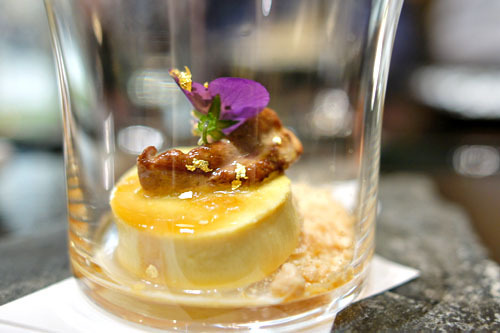 We began with a case of 4 foies 1 cup, with the ingredient presented in four different ways. What struck me first was the temperature contrast between the seared liver and the cool, creamy custard. I also appreciated how the smoky, umami-laden foie was accented by the sweet, spicy smack of the balsamic, and how the egg served to temper the sheer heft of the dish. A promising start to the meal. Next up was a perfectly on point presentation of foie gras torchon, classic in essence, and excellent when taken with the sweetish cylinders of brioche. An accoutrement of fruit--figs and cherries--fortunately did not render the dish overly saccharine, but instead formed a fitting foil to the earthy relish of the liver, as did the zing of the cress and vinegar-y sanbaizu. The most surprising thing here, though, was the roasted eel, which had a deft combination of sweet and savory flavors that actually melded well with the foie. What I liked about the course was that you didn't have to get everything in one bite necessarily; rather, all the various combinations just made sense in isolation. 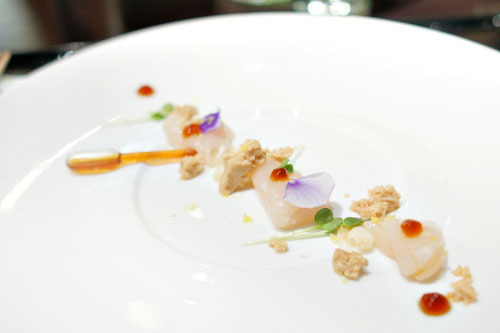 Sashimi of Hokkaido hotategai was presented in glorious fashion, with the scallops arriving remarkably fresh, supple, and delicate, delicious alone, yet beautifully accompanied by the sour bits of yuzu and the piquant taste of ponzu (en pipette). 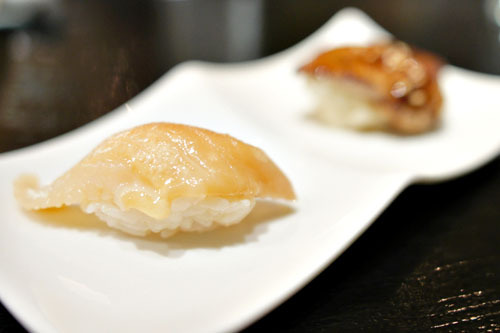 Those classically Japanese accompaniments worked flawlessly, but the key here was that foie gras, which added a wonderful heft to the scallop without overwhelming it. A masterful use of the liver as an accent piece. 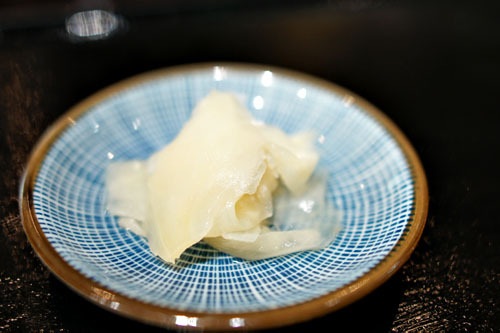 Delicate, translucent slices of hirame were as expected: light, mild, fresh, with a subtle bite and snap. The crux of the dish, thus, was the accompanying bowl of foie gras-infused ponzu, which might've been the best rendition of the sauce that I've ever had. 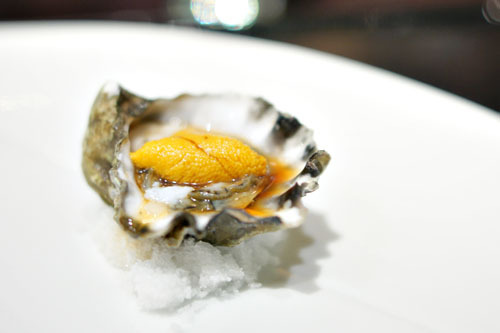 Its combination of earthy, liver-y essence and tart, citric zest was pretty amazing, adding an incredible depth to the fish that, when eaten in concert with the chive, made for some just perfect bites. Humorously, at the conclusion of the course, we all eagerly supped up the remaining liquid! Serving as an intermezzo of sorts was a singular Kumamoto, unabashedly salty and tasting of the ocean, to which a dollop of uni provided a perfectly sweet, luscious counter. 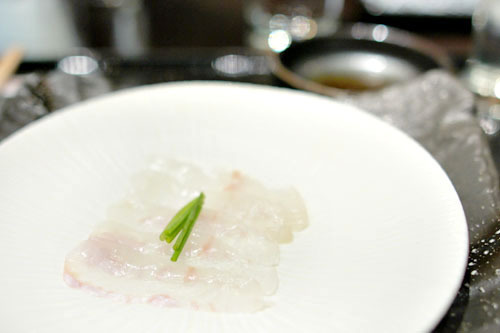 Ponzu, meanwhile, offered up an overarching, integrating tanginess to the course, which finished long and lingering with the briny bite of the oyster. Nakayama's mushimono was obviously another highlight of the meal. The liver itself was poached to a wonderfully soft, silken, melt-in-your-mouth consistency, with a remarkably delicate, subtle foie gras flavor that worked gorgeously with the hearty, heady, umami-laden broth, tinged with just a touch of scallion tang. To that, shards of truffle added an earthy, enveloping veil, punctuating the foie keenly, while perfectly-cooked slices of awabi provided an almost unbelievably satisfying texture contrast. 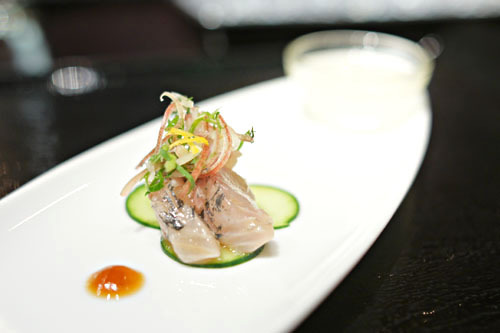 An expertly crafted course, with an Urasawa level of luxury and finesse. 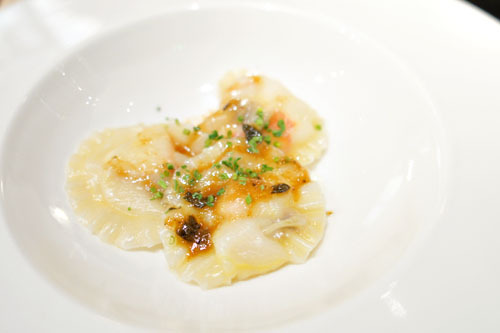 The Chef is somewhat known for her pasta courses, and here she presented a commendable version of ravioli. I really appreciated the snap and crunch of the still slightly rare lobster, which I found sweet and saline in flavor, and deftly accented by the sour pricks of yuzu, all while brown butter and sage added a certain gravity to the dish. 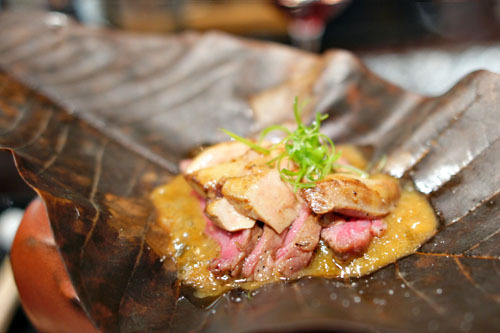 Houbayaki is a method of grilling meat on top of a magnolia leaf, and is a dish that I'd only had previously at Urasawa. The version here was arguably better. The beef itself I found immensely tender, fatty, and flavorful, with a delectable smokiness. I was skeptical at first about the akamiso, fearing that it'd overpower the meat, but it actually imparted a rather enjoyable sweetness to the steak. The foie was also spot on, with a fantastically firm, yet yielding consistency and a forceful, yet subdued taste that went swimmingly against its topping of scallion. Two cuts of wild mackerel were just what I wanted: fishy, but in a good way, with a lovely bit of chew. To that, a mixture of vegetables added a light, bright, refreshing zestiness that worked as a remarkable counter to the fish. Delish. 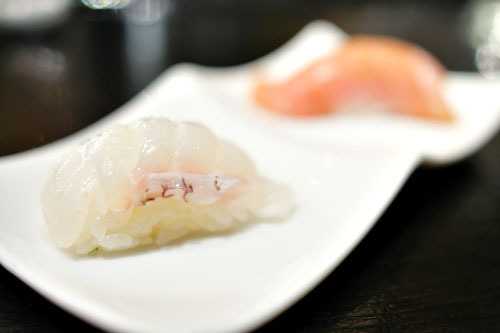 When the gari (excellent here) comes out, you can bet that sushi follows. And here we were able to enjoy our sushi sextet. 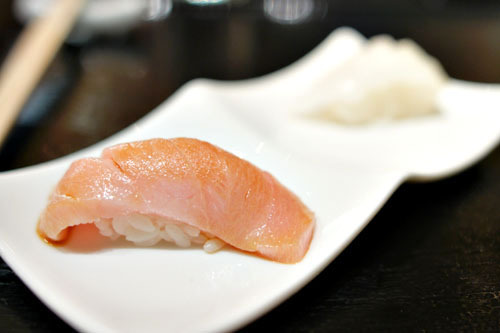 I began with the toro, and it was excellent, a quintessential expression of the lush, oily, fatty fish. The red snapper--so fresh, so clean--was also delightful. 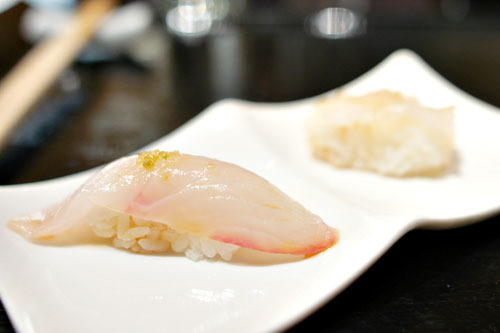 What was even better, though, was that shima aji, which had a topping of yuzukosho that I loved. 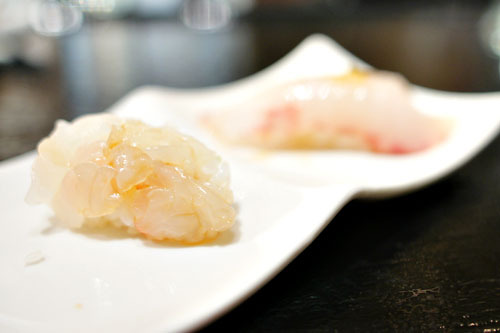 Sweet shrimp, meanwhile, showed off an absolutely lovely texture, and its taste was prototypically sweet and briny, though not nearly as much as the surf clam. 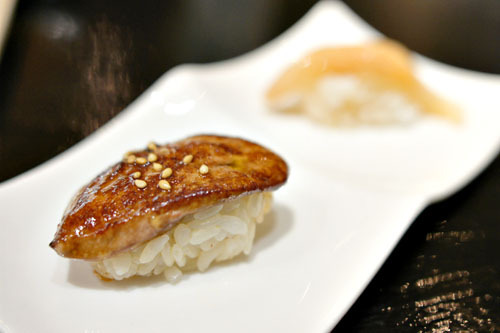 Finishing things off was a mouthwatering foie gras sushi, which conveyed an almost unagi-like sweetness that was utterly balanced by the shari. 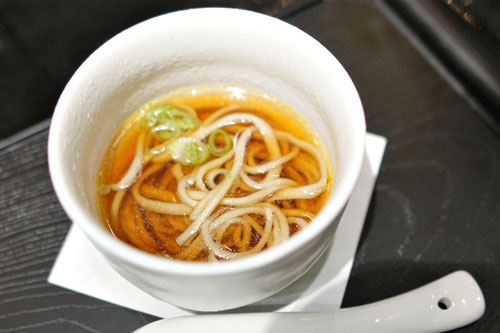 Soba noodles were simple yet profound, with a great al dente bite and wonderfully accented by the savory depth of the umami-rich broth, amped up by the heady essence of foie gras. I wanted a bigger bowl! 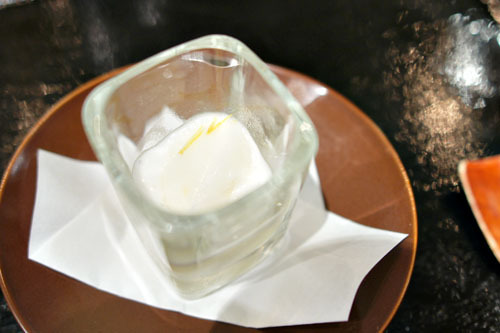 A palate cleanser of lemon sorbet and lemon zest was just what you'd expect: a bracing, citric jolt to the palate--very fitting given the weight of all the preceding courses. 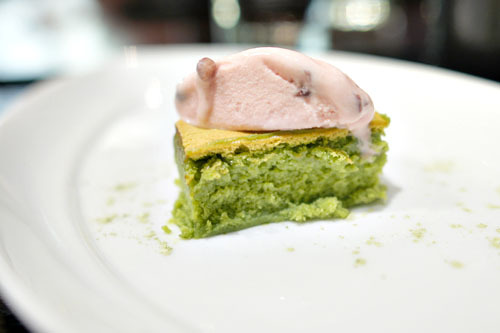 Finally, we had dessert, which underscored the astringency of green tea, playing it against the lip smacking sugariness of red azuki bean. It was a classic combo of bitter and sweet flavors, one that left me wanting more. This was an impressive showing, without a doubt the strongest foie gras-centric dinner that I've had to date. 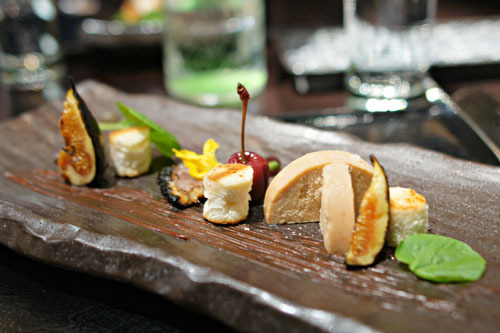 Nakayama did a wonderful job in displaying the various facets of foie, with the ingredient performing flawlessly as the star of the show, as well as a supporting player on the plate. There was tremendous restraint and balance in the food, making for an undeniably cohesive, coherent meal, with constant ebb and flows and a palpable complexity. I've been following Chef Nakayama for a while now, and it's fantastic to see how her cuisine has progressed over time, becoming now much more confident, self-assured, and of course, delicious. 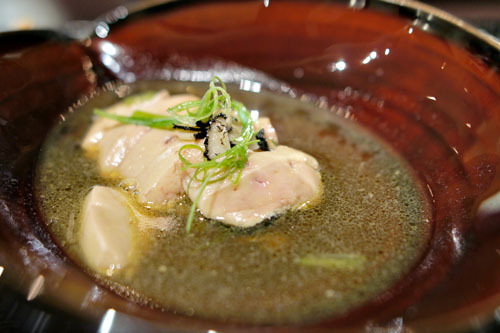 It's cooking that warrants another visit to try the regular kaiseki menu. I went to this diner myself last Friday and I agree, it was totally awesome. You beat me to the review punch though, I had another N/Naka meal in the queue to post :-). I was even worried this would be too much foie, and it was a ridiculous amount, but somehow it didn't overwhelm. This meal looks like it is destined for Kevin's Hall of Fame. My husband and I were seated next to your table. We were happy to see the notes and photos at your table as we wanted to share this wonderful dinner with friends. Thank you. We did Providence on Thursday with only one foie course, "foie drunk" still. But the foie ravioli was beautiful if you are looking for another fix before Sunday. Another foie dinner review...Sorry, Kevin, I get that you love it and that it's a purported delicacy, but these aren't that compelling to read anymore. Too played out. Andy: Indeed; it wasn't overwhelming at all--very balanced. So how much did your foie gras meal differ from mine? Evan: I'm not sure that there exists a "Hall of Fame," but certainly this was one of the highlights of the year. Margaret: During the dinner, were you aware that I was documenting the meal for this blog, or did you find out later? I do need to return to Providence, but it's not going to happen before Sunday. Anon: "Purported?" Just wait a week, and it'll all be over. Two more 'smack' in this review. Don't worry, I'll keep reading and checking for you. More foie please, before the end! Another place I really hope to visit. I've always wondered how the sushi course is presented. Do they all come out at once, or does she prepare each before it comes to the table? Anon: Now hold on now, I don't think "lip smacking" counts! Roddy: Regarding the sushi, they come out in plates of two pieces each, though they could've waited longer in between the plates. Thank you so much for this post -lets me relive the experience through your photos - SO GOOD! We were talking to fellow foodies at a Wolvesden dinner who had done Ludo's foie dinner at Animal and said by the end they were so sick of foie - We guessed Niki's would not have that effect on us and were not disappointed! This was our 2nd visit to N/Naka and both times it was spectacular. @Kevin: Here is my foie menu from N/Naka. As you can see, it's pretty much the same, but we had her make about 3 extra dishes (mostly non foie) because... Well, you've been there :-) But one of them was a very pleasant fish, rice, and tea porridge. AHC: Yeah, somehow I'm not surprised that a foie-centric collaboration between Animal and Ludo would result in some heavy food. ;) I guess that's really why I didn't do more of these types of dinners--I was scared. Andy: Nice! So did you request the three supplemental dishes during the meal, or was this arranged beforehand? What was the extra surcharge? My partner in gluttony had booked this dinner, and he had asked before time. But they asked us on the fly if we wanted more and how many too. I don't remember the damage either, it was around 2am when we staggered out of there. Hmmm there was talk about coming back for a regular dinner here, so we'll have to keep the option of supplemental courses in mind. Truth is, the normal tasting, is a bit shy of truly gluttonous (delicious, but not huge). But Niki is happy to throw in a couple extras.